The truth is that money is often a divisive influence in our lives. We keep our bank balances secret because we worry that being candid about our finances will expose us to judgment or ridicule—or worse, to accusations of greed or immorality. And this worry is not unfounded. On April 15, 2010, the Brooklyn Reading Works will present its monthly writers’ program on “tax day.” This happy accident, observed last summer in a casual conversation over coffee with Louise Crawford, resulted in the idea for a panel called “The Truth and Money,” a reading and Q & A with three authors whose work has taken on money in some significant way. Elissa Schappell, a Park Slope writer, the editor of “Hot Type” (the books column) for Vanity Fair, and Editor-at-large of the literary magazine Tin House. With Jenny Offill, Schappell edited Money Changes Everything, in which twenty-two writers reflect on the troublesome and joyful things that go along with acquiring, having, spending, and lacking money. Jason Kersten, a Park Slope writer who lives 200 feet from our venue and whose award-winning journalism has appeared in Rolling Stone, Men’s Journal, and Maxim. In The Art of Making Money, Kersten traces the riveting, rollicking, roller coaster journey of a young man from Chicago who escaped poverty, for a while at least, after being apprenticed into counterfeiting by an Old World Master. Please join us for the event at 8:00 p.m. on Thursday, April 15, 2010, at the Old Stone House in Washington Park, which is located on 5th Avenue in Park Slope, between 3rd and 4th Streets, behind the playground. Read about all the Brooklyn Reading Works events at Only the Blog Knows Brooklyn and the BRW website. For info on the Old Stone House and its role in the Battle of Brooklyn (1776) and contemporary life in Park Slope, go here. Many thanks from all of us at Truth and Rocket Science to Louise Crawford, of Only the Blog Knows Brooklyn, for making this possible. The subtitle on the cover of Elissa Schappell’s book says everything you need to know about the stories within: Twenty-two writers tackle the last taboo with tales of sudden windfalls, staggering debts, and other surprising turns of fortune. “The last taboo” is how Schappell and her co-editor, Jenny Offill, characterize our behavior when it comes to money, because nobody really wants to talk about it. People are secretive and embarrassed—for having too little, or too much, or something to hide about the reasons either way. In a country where everyone seems to have a story of how they, or their parents or grandparents, used to be poor, any personal narrative but “hard work” is out of the question. Even hardened criminals revel in detailing the blood, sweat, and tears that go into their “work.” No one, it seems, can sit back and say with no embellishment or apology, “I got lucky, that’s all.” Money is the measure of what we deserve, and in our society what we deserve is in some sense who we are. Once out of poverty, in other words, what we do with money—or more precisely the things we feel when using money—have a lot to do with ancient urges and inner conflicts that endure in our minds, bodies, and culture across time and without, so it seems, our self-conscious awareness of them. Money does buy happiness, up to the point we’re out of poverty, and then the real problems begin. Like the craving for fat and things that are sweet, the urges we satisfy with money are deeply embedded in our being, fundamental to the way we evolved in the most far-away places and times. It’s all fine and easy to understand or forgive, but we all know what happens when you eat too many doughnuts. Money in this sense becomes nothing but a means of measurement, and it would be perfect indeed if money’s effects on the world ended there, but we all know that they don’t. Marx may have fallen short as an economist, but then again so do most official economists. In terms of money’s most basic ontological properties, however, it’s worth noting that he got money right. So where does money get us? It’s easy to tell stories of money and doom, but we all know that without enough of it we’d be unable to do anything we need to do, let alone the supposedly unnecessary things that seem to make up for the drudgery of a life built upon doing the things we need to do. Is the grubbiness of money as it comes off in the Pink Floyd song all there is to it? Or is there more? Join us on April 15, after affirming the give-away of twenty-eight percent (for most of us) of your annual harvest. Many thanks to Louise Crawford for inviting me to curate the Tax Day BRW panel, through the Truth and Rocket Science blog. A sincere debt of gratitude, not to mention late fees, is owed to the Brooklyn Public Library, for enabling my research and inquiry into this topic. The BPL’s copies are indeed those photographed on my dining room table to lead the blog post. Jenny Offill and Elissa Schappell, Money Changes Everything (New York: Doubleday, 2007). Jennifer Michael Hecht, The Happiness Myth (New York: Harper One, 2007), p. 129. Adam Smith, The Wealth of Nations, in Robert L. Heilbroner, ed., The Essential Adam Smith (New York: W. W. Norton, 1986), p. 173. Karl Marx, Economic and Philosophic Manuscripts of 1844, in Robert C. Tucker, editor, The Marx-Engels Reader, 2nd ed. (New York: W. W. Norton, 1978), p. 103. 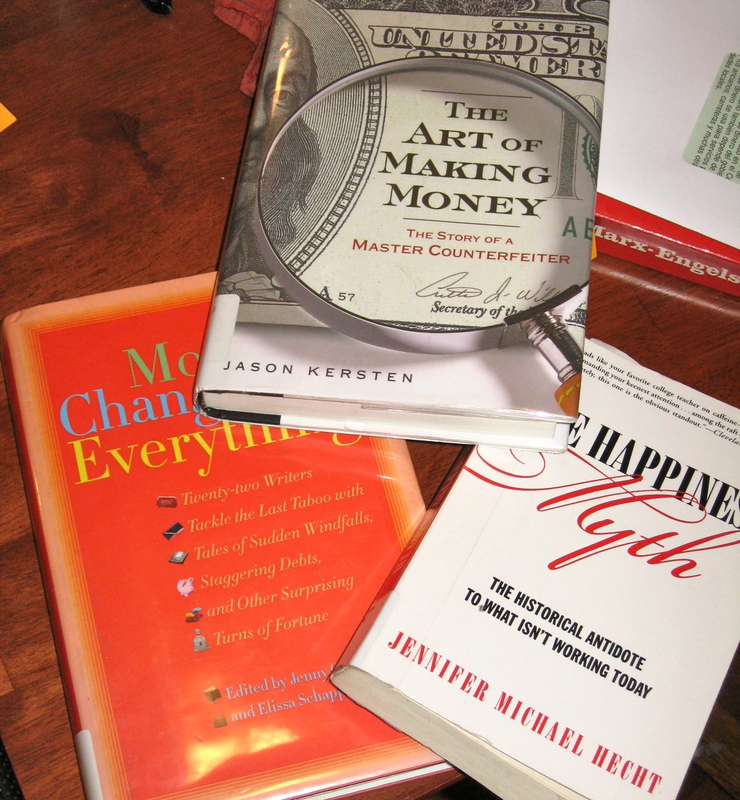 Jason Kersten, The Art of Making Money (New York: Gotham Books, 2009), p. 152 (first quotation) and p. 4 (second quotation). 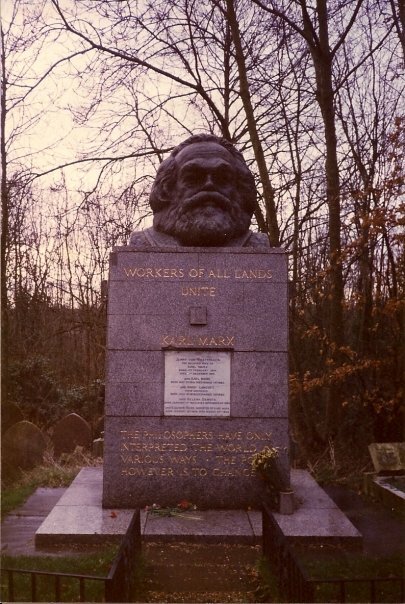 Photo Karl Marx’s grave, Highgate Cemetary, London, taken by the author in January, 1994, while on layover on the way to South Africa and its historical elections later that year.